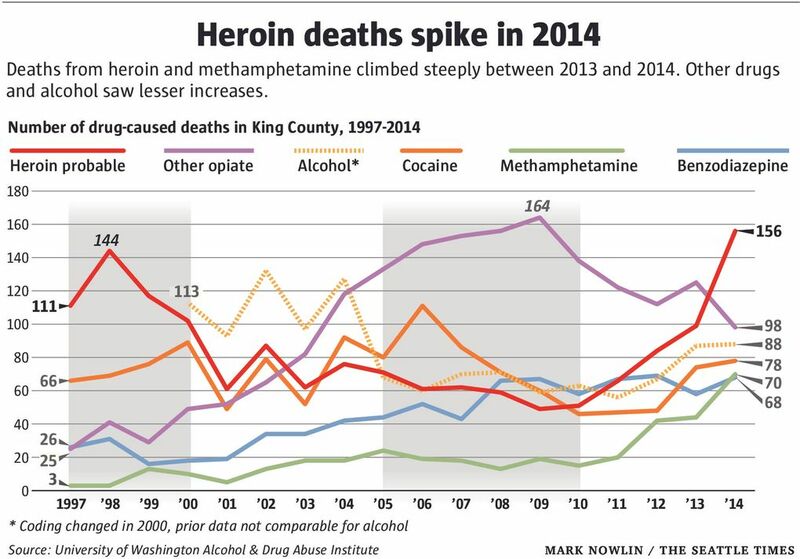 Fatal overdoses linked to heroin climbed by 58 percent in the Seattle/King County area last year, the largest rise in local drug-related deaths in 17 years. Methamphetamine-related deaths also rose 59 percent. Drug overdose deaths are now the leading cause of injury death in the United States. The local spike comes even as deaths tied to opiate painkillers — pills like Oxycodone — fell to the lowest levels in more than a decade. There were 98 deaths in that category last year, down from 164 in 2009, a 40 percent drop. That likely reflects the results of a national crackdown on the prescription medications that has made it harder to obtain and abuse the legal drugs, said Banta-Green. “A lot of the decline in deaths from prescription opiates is in people who don’t have illegal drugs in their system,” he noted. But those who did die from illegal drug use were not isolated in a single group. Deaths were reported in all corners of the county, among men and women and across age ranges, with a bump in those older than 50. Banta-Green said that’s different from previous years, in which heroin deaths were concentrated among young-adult users. “The main issue is that there are a lot more users,” he said. In addition, the type of heroin being seen in the area may have higher purity, making it more potent and more deadly, he added. New state figures for heroin-related deaths aren’t available, but Banta-Green said he expected the number to top the 227 deaths reported in 2013. Nationally, drug-overdose deaths have more than doubled in the past 14 years to become the leading cause of injury death in the United States, according to a study published Wednesday by the nonprofit Trust for America’s Health. There were nearly 44,000 drug- overdose deaths nationwide in 2013, the most recent figures available. Washington state ranked 23rd highest for drug overdose deaths, at a rate of 13.7 for every 100,000 people in the state, the report found. But Washington is also among 34 states and Washington, D.C., that allow access to an opiate antidote — drugs that can reverse overdoses in minutes. Naloxone, known also as Narcan, is available at dozens of sites statewide, available to addicts, families, agencies and others who might need to revive someone after an overdose. “The more naloxone you get out to heroin users, the lower the death rate,” Banta-Green said. Seattle’s downtown syringe exchange distributed 926 kits and reported 224 reversals, said Dr. Jeff Duchin, who was formally named health officer for Public Health — Seattle & King County this month. The People’s Harm Reduction Alliance in Seattle distributes about 2,500 kits in King County each year, said Executive Director Shilo Murphy. A directory of Narcan sites is available at www.stopoverdose.org. “Lives can be saved if friends and families of drug users obtain naloxone and learn how to use it,” Duchin said. But the real fix, Banta-Green added, is getting people into medication-assisted drug treatment. Last year, there were nearly 3,000 admissions to treatment for primary heroin addiction, the study found. That’s a third higher than the previous year and double the number from 2010. “People need to understand that untreated opiate addiction can be deadly,” he said.